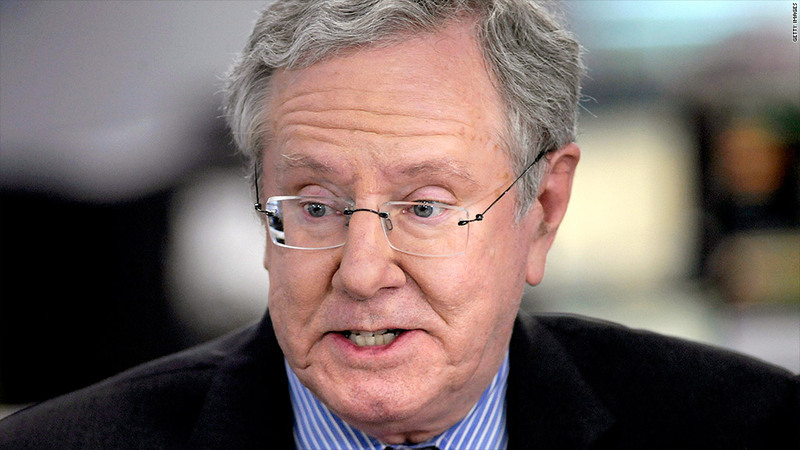 Steve Forbes, who could be the last member of his family to own the business magazine started by his grandfather. The company is exploring a possible sale. Forbes Media, the family-owned business magazine publisher, has hired Deutsche Bank to explore a possible sale of the company. A letter sent to employees Friday by Forbes Media president and CEO Mike Perlis said the move is prompted by "more than a few over the transom indications of interest" to buy the company. "The frequency and serious nature of these overtures have brought us to a decision point," he said in the letter. Its flagship property, Forbes, with a circulation of 933,000, is the third largest U.S. business magazine, according to the Alliance for Audited Media. It lags Time Warner's Money magazine and Bloomberg Businessweek, owned by financial publisher Bloomberg. It has about 370 employees. Print media has been a difficult business in recent years due to losses of both readers and advertisers to online media. Forbes' ad revenue for the first 9 months of the year fell 7.5% to $165.7 million, according to the Association of Magazine Media, and the ad pages in the print edition have fallen 12.5%. Perlis' letter said that digital revenue at the company is expected to increase this year. The company also owns a number of web sites beyond Forbes.com, including Investopedia.com, and the RealClear family of sites such as RealClearPolitics. But if Forbes is sold, it would join a trend of print properties being sold. In March Time Warner (TWX), which is also owner of CNNMoney, announced its plans to spin off its Time Inc. publishing unit, the nation's largest magazine publisher, in a deal set to close early next year. That unit includes both Money and Fortune magazines. Newsweek, the news magazine whose print version was abandoned late last year, was sold in August by IAC (IACI) to another all-digital news company, IBT Media. Major newspapers have also been put on the block and sold this year. Amazon (AMZN) founder Jeff Bezos is buying the Washington Post for $250 million in a deal announced in August, and the New York Times Co. (NYT) announced it would sell the Boston Globe for only $70 million to Boston Red Sox owner John Henry, despite having paid $1.1 billion for the paper in 1991. Forbes was started by B.C. Forbes in 1917. His son, Malcolm, succeeded him as publisher. He handed it down to his son, Steve, who is still chairman and editor in chief. But two years ago, Perlis was brought in as the first non-family member to serve as CEO of the company. The Forbes family also sold a minority stake in the company to investment firm Elevation Partners -- which includes rock singer Bono among its partners -- in August 2006. Elevation did not return a call seeking a comment on the sales plans.